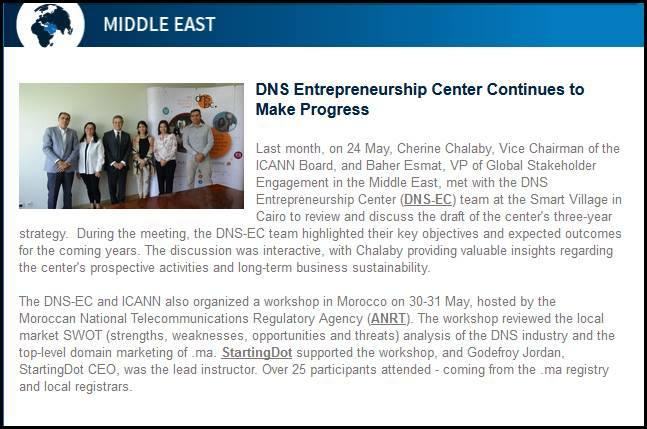 Last month, on 24 May, Cherine Chalaby, Vice Chairman of the ICANN Board, and Baher Esmat, VP of Global Stakeholder Engagement in the Middle East, met with the DNS Entrepreneurship Center (DNS-EC) team at the Smart Village in Cairo to review and discuss the draft of the center's three-year strategy. 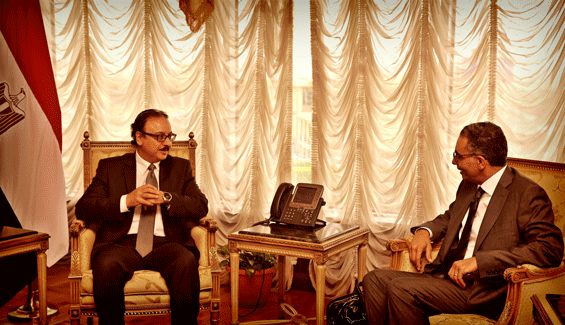 During the meeting, the DNS-EC team highlighted their key objectives and expected outcomes for the coming years. The discussion was interactive, with Chalaby providing valuable insights regarding the center's prospective activities and long-term business sustainability. The DNS-EC and ICANN also organized a workshop in Morocco on 30-31 May, hosted by the Moroccan National Telecommunications Regulatory Agency (ANRT). The workshop reviewed the local market SWOT (strengths, weaknesses, opportunities and threats) analysis of the DNS industry and the top-level domain marketing of .ma. StartingDot supported the workshop, and Godefroy Jordan, StartingDot CEO, was the lead instructor. Over 25 participants attended - coming from the .ma registry and local registrars. Earlier this week, ICANN, together with Egypt's National Telecommunications Regulatory Authority (NTRA) announced the launch of a first of its kind regional DNS Entrepreneurship Center (DNS-EC) in Egypt. This is an important initiative to support Internet growth in the communities of Africa and the Middle East. The Domain Name System has enormous potential to foster the development of new businesses in Africa and the Middle East while delivering countless benefits to Internet users. ICANN is committed to this story. And now, after months of planning and preparation, we are proud to bring this incredible resource to Cairo.